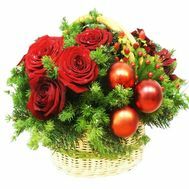 New Year's compositions will help create a cozy atmosphere of warmth and trust, which we so often see in Christmas movies. 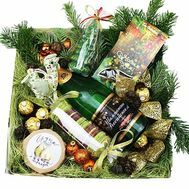 The beauty and sensitivity of such a gift will make such a simple holiday more desirable and interesting for each member of the family. 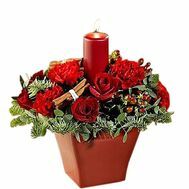 The composition for the New Year is a gift that can create a warm, family and festive mood. 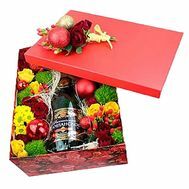 With the help of such a presentation, you can not only surprise your loved ones suddenly, but also give them something special, for the heart and soul. 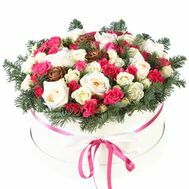 Composition for the New Year can have a different design, depending on your wishes. 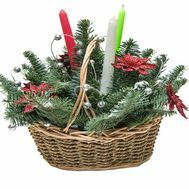 It can be decorated with New Year's toys, rain, with spruce branches and beautiful, decorative candles. 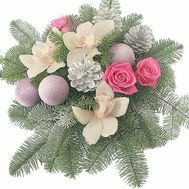 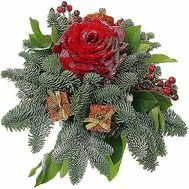 The aroma of spruce, delicate and enchanting, proceeding from such a gift, will entice the recipient into the world of festivity and magical mood. 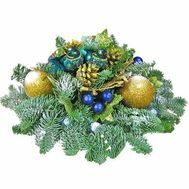 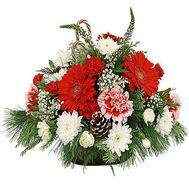 But the composition, decorated with cones, can be put on the table or after hung out on a Christmas tree, thereby beautifully decorating it. 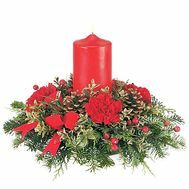 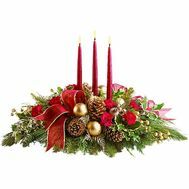 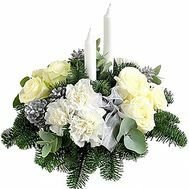 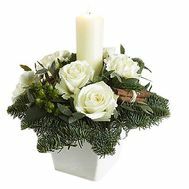 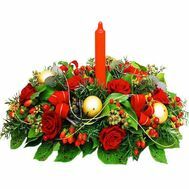 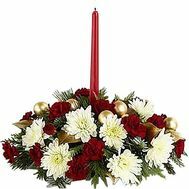 But the most popular and aesthetic appearance of its kind is the Christmas table composition with candles. 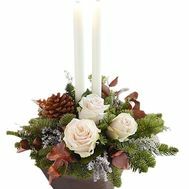 It carries a certain secret meaning, and the light of beautiful candles will only make the situation at the table brighter and more romantic. 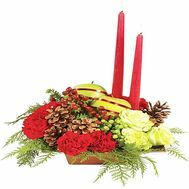 Composition with candles will be an ideal gift for loved ones in honor of such a warm holiday. 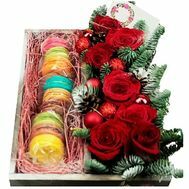 Still do not know what to give to your relatives for the winter holidays, which come on your heels? 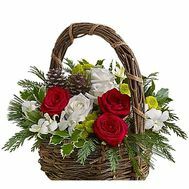 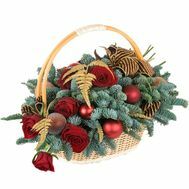 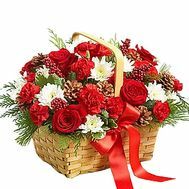 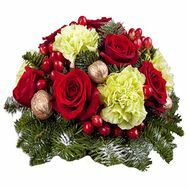 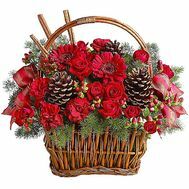 Then pay attention to the New Year's composition in the basket - a beautiful and unusual present that will remain in your memory for a long time. 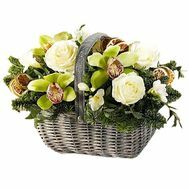 Our store has more than 10 years of experience in the floristic market of Ukraine. 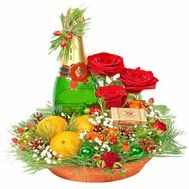 Our clients, whose number has already exceeded 40,000, know that we always have the most democratic prices, various promotions and discounts. 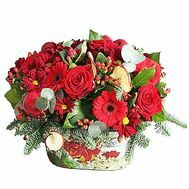 As well as friendly staff and quality service. 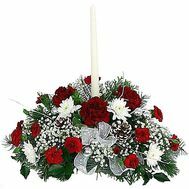 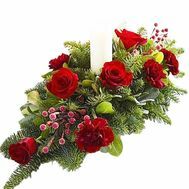 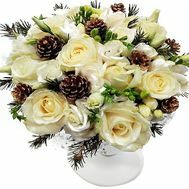 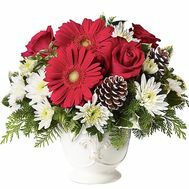 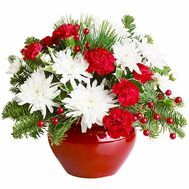 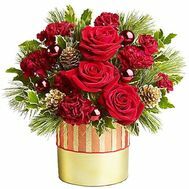 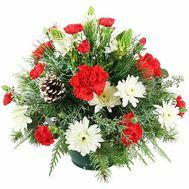 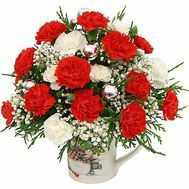 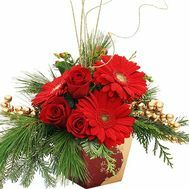 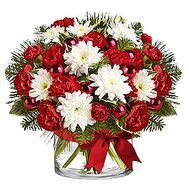 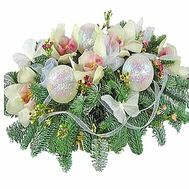 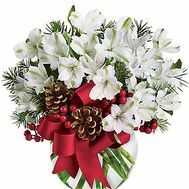 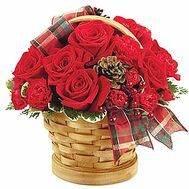 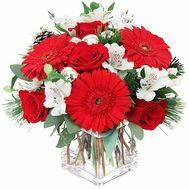 Our flower delivery service will bring a present at any time appointed by you. 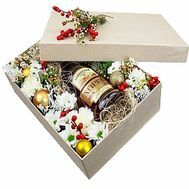 Do you want to make an original gift for the New Year? 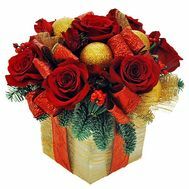 Order from us one of the compositions, which will be the best gift you have ever made!